In a world first, a US-based company has been granted permission to travel beyond Earth’s orbit into deep space. Moon Express, founded in 2010 by billionaire tech entrepreneur Naveen Jain, just received FAA clearance to send a robotic probe to the moon’s surface to scout it for valuable resources. If successful, Moon Express could pave a path for other companies to begin tapping the moon for iron ore, water, rare earths and precious metals, with the goal of turning Earth’s nearest neighbor into a way station for spare parts and rocket fuel. As Moon Express notes on its website, water is “the oil of the solar system,” and the ability to access this vital resource off Earth would vastly reduce the cost of more ambitious deep space missions. And Moon Express isn’t the only game in town—earlier this year, Luxembourg announced a partnership with asteroid mining company Deep Space Industries, which hopes to begin launching robotic spacecraft on near Earth object prospecting missions in a few years. Both DSI and Moon Express are benefiting from the US Commercial Space Launch Competitiveness Act, a new law that grants companies legal ownership over any resources they’re able to mine off Earth. Whether more private ventures will soon receive clearance to fulfill their space mining dreams may hinge on the success of Moon Express, which stands to receive $20 million from Google’s Lunar XPRIZE competition if it can carry out its mission, of landing a spacecraft on the moon and beaming photos and video back to Earth. 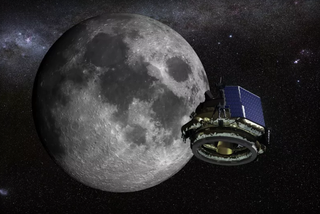 Moon Express hopes to become the first private company to land on the Moon in late 2017.